Join us for the Collective Call to Action's next book discussion and webinar (March - April, May) which will be facilitated by the California Mathematics Council-South (CMC-South). The readings and reflection questions provide a focus as you study, reflect, and contemplate the action(s) you will take as you continue your equity walk. Each month’s reading is now for two months followed by a webinar. We look forward to our year of learning together. View the list of articles and books for the 2017-2018 learning and visit the MyNCTM community to join the online discussion forum. More information about the nomination process can be found HERE. Please send your nomination(s) to the Nominations Chair, Steve Viktora, HERE or [email protected]t before the deadline. TODOS: Mathematics for ALL, 2018 conference is June 21 - 23, 2018 in Scottsdale, AZ. The theme is It's ALL about ALL Students Learning Quality Mathematics: Advocating for Equity and Social Justice. Keynote speaker is Dr. Maria del Rosario Zavala. Registration information can be found HERE. All NCSM members are automatically subscribed to NCSM's eNews. Anyone can subscribe to this electronic newsletter (members and non-members). Encourage others to subscribe. Forward this issue to your friends and colleagues who work in or have an interest in mathematics education leadership - or have them click here where they can subscribe themselves. We are excited to accounce our second position paper released this year is now available. Members attending the 50th Annual Meeting in Washington D.C. will receive a copy of the position statement in their conference bags. All members are able to access it now on our website. Confusion being created from attempts outside of mathematics to equate learning computer science with mathematics courses makes it critical for us to outline our position. Our position statement is a starting point for essential conversations needed as we explore how to inform stakeholders and other leaders about points to consider when making decisions. NCSM believes that both computer science and mathematics are essential domains of study for 21st century students. We acknowledge that there are areas of overlap between the domains, which should be used to further advantage, but also recognize that there are important differences. Both involve computations and the development of thinking processes and practices, but computer science does not target the specific mathematics to the breadth and depth expected in state and provincial mathematics standards. Given this, NCSM believes that computer science and mathematics courses are not equivalent and takes the position that a computer science course that does not intentionally target a full course of mathematics standards should not count as a mathematics course. NCSM also cautions that the use of a computer science course as a substitution for a mathematics requirement must never adversely impact preparation for college or career readiness. Please take the time to read the position statement and engage stakeholders. As with each issue affecting the education of our students, we as leaders need to take a stand to provide equitable, high-quality mathematics experiences for each and every learner. I look forward to seeing all of you that can attend at our 50th Annual Celebration in Washington D.C. next week. There are so many fantastic choices during each session and I know you will find options to inform your work. We have sold out of tickets for our 50th Celebration event off site at the National Geographic building. The entertainment at this event will be Under/Over 50 and I am sure you will hear great things. Maybe even see a clip or two. The gift that night will be a booklet with the historical update about NCSM. In addition, on Tuesday, you can purchase a copy at our bookstore. 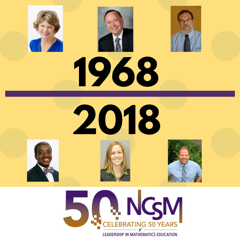 Are you planning on attending the 2018 NCSM Annual Conference? The pre-conferences are designed so that early arrivals can start their learning and networking right away. Sessions run from 1 pm to 4 pm on Sunday April 22nd, leaving you plenty of time to pick up registration materials and enjoy the sights in Washington DC later in the afternoon. We are featuring two sessions, one focused on coaching and the other on equity and social justice. There’s something for everyone! Read more about the sessions here and you will be able to register for the pre-conferences on-site. NCSM Summer Leadership Academy, "Building Mathematics Leadership: Coaching"
Ready to make a real difference in the teaching and learning of mathematics? Do you realize that coaching is recognized as one of the most powerful ways to impact teacher growth and student learning? If your district/school has a coaching program or is thinking about starting a coaching program; join NCSM and their Coaching Team for the NCSM Summer Leadership Academy at the Doubletree by Hilton Denver Tech Center in Greenwood Village, CO (Denver area) – July 30 to August 1, 2018. Developing a strategic plan to support own and/or district goals for coaching. More information and registration is available HERE. We are excited to be hosting this coaching theme for our Summer Leadership Academy. We hope you are, too, and that we will see you in Colorado at the end of July!